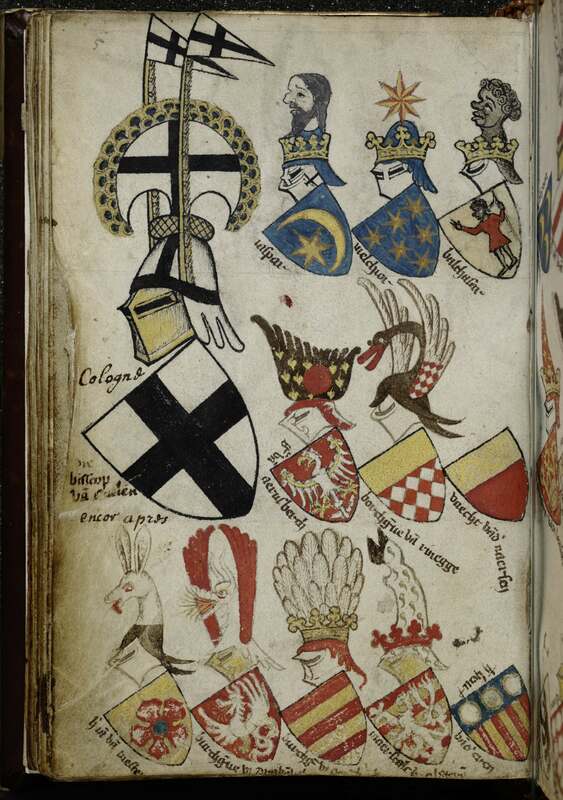 The illustrator of a fourteenth-century catalogue of coats of arms, known today as the Gelre Armorial, invented a coat of arms for the Three Kings/Magi to accompany the crest of the Archbishopric of Cologne, site of shrines to the Three Magi and to St. Maurice. The crest for a Black Balthasar, which features St. Maurice and his spear, was influential in spreading the image of a Black figure as a symbol for the reach of Christianity. Source: Gelre Herault d’Armes (ca. 1370-1395), Bibliotheque Royale Albert Ier Ms. 15625-5, fol. 28v. Imagining a crest for the Black Magus (ca. 1370-1395) by Jeff Bowersox is licensed under a Creative Commons Attribution-ShareAlike 4.0 International License.